Sabres GM Tim Murray couldn't hide his disappointment in losing out on the Connor McDavid sweepstakes in the draft lottery. The Buffalo Sabres spent all year stinking up the NHL for a 20 percent chance of winning the NHL Draft lottery and earning the chance to select uber-prospect Connor McDavid first overall. They finished last in the league with a 23-51-8 record guaranteeing the club would pick no lower than second, where talented Boston University center Jack Eichel is projected to go. When the ping pong balls bounced Saturday for lottery, they bounced in favor of the Edmonton Oilers, who finished with the third-worst record in the league. Despite just an 11.5 percent chance of picking first, they won their fourth lottery since 2010. When it came time to face the media, Sabres general manager Tim Murray couldn't even feign excitement to have at least landed Eichel. #Sabres gm Tim Murray. "I'm disappointed for our fans." Can't wait for Jack Eichel's introductory press conference in Buffalo with that kind of endorsement. 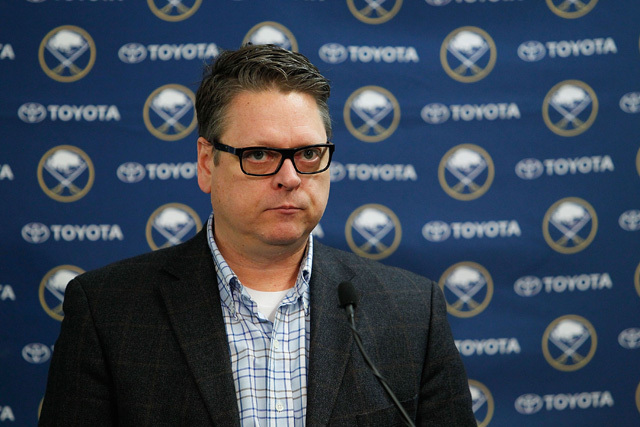 Now, of course Murray was speaking less about Eichel and more about losing the draft lottery. As he said, if you can either be first or second, you always want to be first. And there's really no question among scouts, team execs or anyone in hockey that McDavid is the clear No. 1. Losing out on the best draft prospect since Sidney Crosby is pretty tough. However, after a season of such horror, you've got to be a better salesman than "I'm disappointed for our fans." It was always more likely that the Sabres would end up with Eichel instead of McDavid, even though finishing in last place would give Buffalo the best chances of any organization of landing the 17-year-old Erie Otters captain. That wasn't saying much, though, as they were four times as likely to not land the first pick. Miss out on No. 1, at least there was no way they could lose out on No. 2. But he couldn't even sell this to the fans because he and this disaster of a season failed to bring the result that only had a 20 percent chance of happening. He even said the team expected to come into this getting the second overall pick. He followed that up by saying "we're going to deal with it." There are 28 other GMs that would gladly trade places with Murray right now. They'd love to have something like that to deal with it, like landing one of the best freshman players in the history of college hockey (not an exaggeration) and having at least seven years of NHL service from that same player before he can hit unrestricted free agency. Murray even complained about having to show up to the lottery only to lose. GMTM: "Thankfully it's a short drive from Buffalo. I'd hate like hell to be flying across the country to take part in it. " The reality is that all of that tanking was only worth it because of Eichel. Had there been a prospect of a lower caliber at No. 2 this year, there would have been less of an incentive to finish in last place for the best shot at the No. 1 pick. The odds just aren't in your favor, but the fact that there were two potential franchise cornerstone players at the top made a last-place finish more palatable. But here's what Murray told the New York Times just a few weeks ago about McDavid. "I watch him too much and I think too much about him. 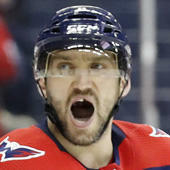 I wish I could help myself," Murray said, sounding less like an NHL GM and more like a boy with a crush. When something like that gets out there, the fan base knows that the GM has eyes for only one player and anything less simply isn't enough because it's not going to be enough for the GM. Everyone knows that there was a chance at something a little better, but that's why you can't pin your hopes on 20 percent. Murray said he is disappointed for the fans, but he's the one that set them up for this disappointment. He did it by constructing a roster that couldn't win, hanging on to a coach that couldn't win, as badly as he wanted to, and making the public statements that he did about McDavid. There are other ways the Sabres set the fanbase up for this kind of disappointment, too. This might have been the most foolhardy act of all. The organization hosted McDavid's Erie Otters and nearby Niagara Ice Dogs for a regular season Ontario Hockey League game just so Sabres fans could get an up-close look at the kid. Earlier in the fall, they had a game featuring Eichel there, too, but that was part of the All-American Prospects Game. That was an event on which the organization bid, was awarded and will host again next season. It was pre-planned. They actually went out of their way to get McDavid in there. The Sabres had 11,391 people in First Niagara Center for that OHL game in which McDavid dazzled. And again, this was in October, months before they finished the season with a pathetic 54 points. Sabres fans were already buying Buffalo McDavid jerseys. Some were so convinced that finishing last would bring them the golden child that they actively rooted against their team. Here's the worst part of Murray's reaction: The Sabres are a lot better of an organization today because they will pick second. They are going to land a player that is probably going to make significant impact on their organization the second he puts on a blue and gold jersey. Jack Eichel may not be Connor McDavid, but he is as good a second overall pick as you could hope for if you miss out on the top prize. Any year for at least the last five drafts, Eichel's performance this season would have landed him at the top of the draft. At 18 years old, he had 71 points in 40 games, led Boston University to the national championship game a year removed from one of their worst seasons in program history, and became the second freshman to win the Hobey Baker since Paul Kariya in 1992-93. And before Tim Murray could even step to the podium to call Eichel's name, he's put the player that is likely to be the franchise's best over the next several years in a hole -- assuming they pick the BU star. Should he be selected by Buffalo, Eichel has no choice but to try to live up to McDavid, to be as good or better, to bring Buffalo its first Stanley Cup, to win major awards and that's an unnecessarily tall order for him that will put undue pressure where it shouldn't exist. Murray has a right to be upset that the draft rules changed this year and the weighted lottery results gave the last-place team 5 percent less of a chance to nab the top overall pick than it did previously. I can expect him to be frustrated that a plan did not work and he sat through an entire season as bad as the one they just had. Now, it wasn't all doom and gloom. Murray perked up as he continued to talk (video below). Murray knows the Sabres still have a good player on their hands and that they can continue to build towards their ultimate goal, but the headline is what it is. Not getting McDavid stings, and the yearlong buildup with all of the tanking stings, too. What should upset Sabres fans is that the general manager says he was prepared for a result and didn't do a great job selling it to the people that sat through that season. If you're going to gamble and go all in on a season of horror, it's best not to do it on a 20 percent chance.